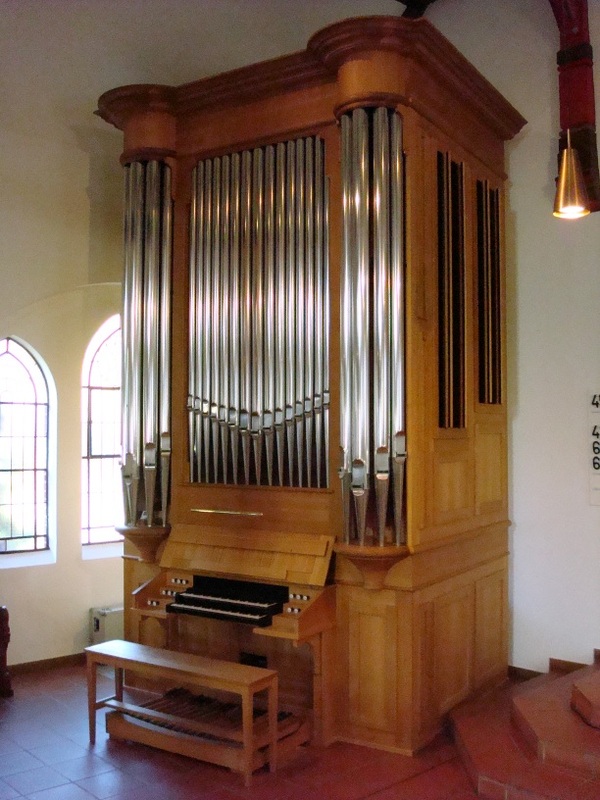 We are pleased to offer you a very special organ, the Baumhoer organ of Bielefeld-Stieghorst. The concept for this small instrument is based on a sound ideal that is not found in small organs very often nowadays, the symphonic concept á la Aristide Cavaillé-Coll. The french master organ builder was highly gifted in achieving a symphonic oriented disposition even in his smallest instruments, that would be suitable to accompany congregational singing as well as to play concerts. This symphonic orientation forms the basis of the Stieghorst organ as well. The result is an instrument that sets a course and is very distinctive from the mainstream of modern organ building. With this organ we present you with a sample set that is highly suitable for a broad spectrum of music even though it is a very small instrument. With its precise touch and the rather dry acoustic it is also an ideal instrument for practise, and it is quite amazing how full these few stops can sound. To install the licensed download version the free trial version (appr. 3.3GB download) of this set must be installed first, as it only contains a new organ definition file. A free trial version of this sample set is available. Please look at the 'Trial-Version' tab for details. Note: The trial version only contains the "original" version of the set. The organ built by Albert Baumhoer for the protestant church of Bielefeld-Stieghorst is a special treasure indeed. The instrument with just 11 ranks was designed following the symphonic esthetic principles of Aristide Cavaillé-Coll (1811-1899). Each stop is voiced to emphasize melodic lines and to be able to accompany itself. Powerful overblown flutes blend well with the ensemble. Distinctive reeds provide brilliance (Trompette harmonique) and warmth (Basson-Hautbois). Each manual is equipped with its own swellbox in a fully enclosed case: The Grand-Orgue sounds from swell shades on the sides and through the facade pipes, the Récit with its two french reeds sounds from the top and also the sides of the case. The scaling of the pipework follows Cavaillé-Colls' instruments in Saint-Etienne, Caen and the choir organ of Fécamp. The instrument has been voiced by Hugo Wiedemann. Some specific characteristics of the instrument shall be pointed out here. The Plein-Jeu has been designed with a continuous 2' rank, which can be used as a separate stop (Doublette 2'). This allowed to dispense with a separate 2'-stop, saving precious space in the organ case. The facade pipes are partly silent, and part of them are the 15 lowest sounding notes from the Montre 8', which therefore are not influenced by the swellbox. More information about this beautiful instrument can be found here (German language only!). The instrument has been recorded by Peter Ewers in 2009 using high quality Neumann micorphones. Each individual pipe has been recorded separately including two additional release layers for a perfect rendition of short notes. Tracker action, stop action and blower noises have been recorded as well. The recordings were done using 24bit 96kHz recording and all processing has been done at that sample resolution as well. A multi-stage denoising process ensures complete supression of unwanted noise and at the same time preserves faithfully the natural speaking sound of the pipes. The samples have been sampled down to 48kHz for final distribution. All loop points have of course been set using our own development, the SampleLooper. The design of the virtual console is using images from the real organ and is optimized for a 1024x768 pixel screen size. Four pages are provided: A console page with all stops and controls, two pages (left and right) for very high resolution touch-optimized stop tabs and one page showing the keyboards and pedalboard. The virtual console was designed to give a maximum readibility and to be touchscreen-friendly. Please click on the "Images"-Tab above for some screenshots. 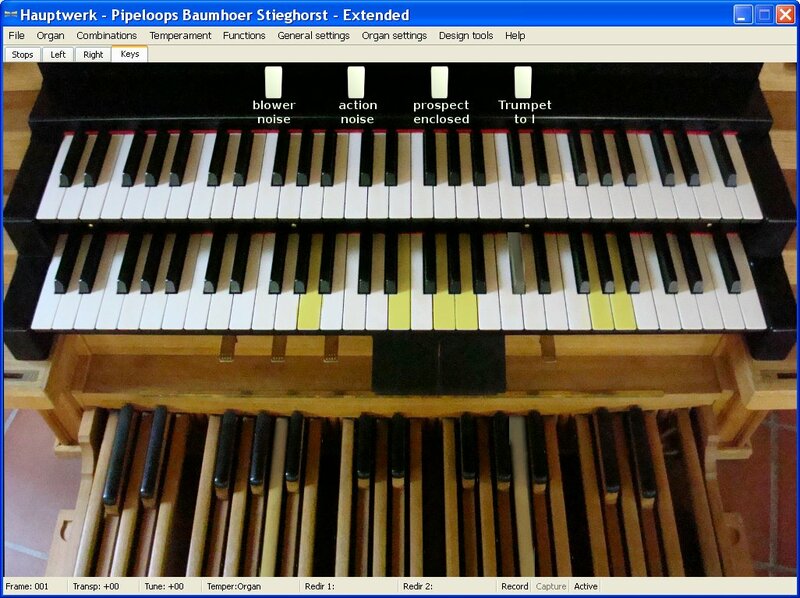 The virtual organ provides some special features to allow more flexibility. Extra buttons on the keyboard page allow to turn on/off the blower and action noises. Another button puts the facade pipes of the Montre 8' into the virtual swellbox, thus providing a more consistent sound with closed swells. 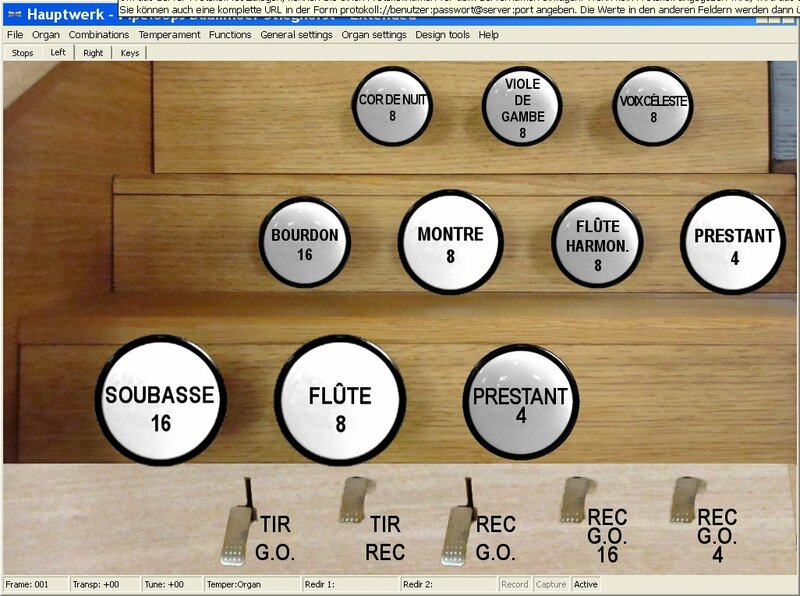 Finally the Trompette harmonique can be placed into the Grand-Orgue, allowing to control both reeds independently. This sample set requires HW version 3.2 or greater. Note: This sample set is compatible (with limitations) with the Hauptwerk Free Edition! It will however not fit into the sample memory allowed by the Hauptwerk Free Edition using the default loading options, so you will have to e.g. set a few ranks to use only the first available loop. Also the polyphony limit set by the Hauptwerk Free Edition will not be sufficient to play big chords with full Tutti registration, but it should be sufficient for most normal uses. Even though the organ is quite small and reverb tails are fairly short, playing big chords with full registration and making full use of sub- and super-octave couplers will require an available polyphony of about 1000. The Hauptwerk Basic Edition should hence be sufficient for nearly all playing styles on this sample set. 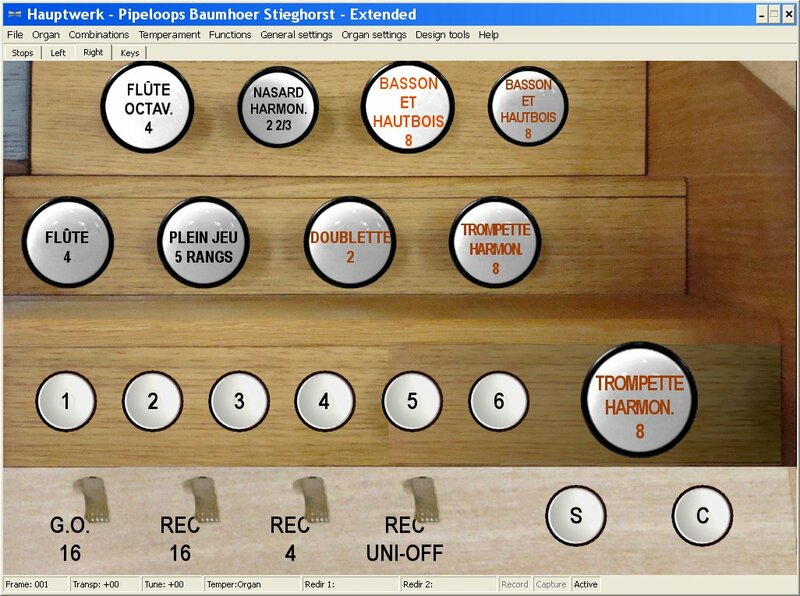 The Free Edition will allow to play a wide variety of music on this organ, but with full registrations the polyphony limit will be exceeded quickly. e Edition using the default loading options, so you will have to e.g. set a few ranks to use only the first available loop. Also the polyphony limit set by the Hauptwerk Free Edition will not be sufficient to play big chords with full Tutti registration, but it should be sufficient for most normal uses. The following pieces have been played live and recorded directly to disc with Hauptwerk. No additional processing has been applied. All demos are available in mp3 and wav format. We would like to thank Anton Doornhein for these beautiful performances. Please click on a stop below to hear a short improvisation using that stop (transmissions are omitted from the list). These short demos show very nicely the quality of the voicing of this instrument, where each stop is voiced to be able to accompany itself. We would like to thank Anton Doornhein for playing these beautiful demos for us. The soundfiles are in uncompressed wav-format for best quality. These recordings have been created from MIDI-files kindly provided by James Pressler (recording directly to disk with Hauptwerk. No processing of the final signal except adding reverb where indicated). 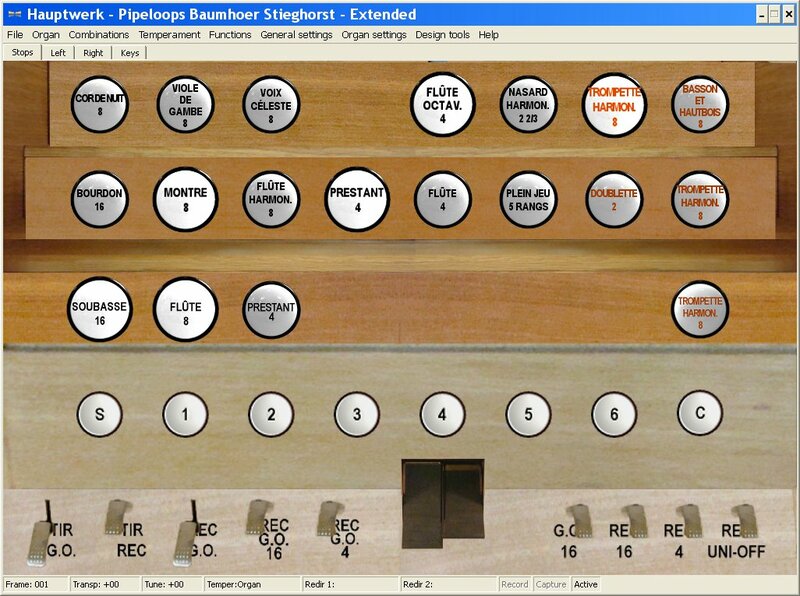 This is the trial version of the sample set of the Baumhoer organ in Bielefeld Stieghorst (Germany). Only the "original" version of the set is included, not the "extended" version. Please have a look at our patches page for the latest patches for this instrument.